The escalating cost of developing drugs is due, in part, to time spent assessing compounds that fail further down the drug discovery process. As such, high-content analysis (HCA) is now emerging as one of the most prominent areas in drug discovery due to its role in assessing the suitability of compounds, or targets, for extensive testing at an earlier stage in the process. The two main types of HCA instrumentation are automated fluorescence microscopy and laser-scanning cytometry. Both provide multicolored fluorescence readouts in fixed and live cells by observing fluorescently tagged markers of cellular activity, allowing researchers to screen for multiple cellular events using a single assay. Fluorescence microscopy-based systems offer information-rich data at a high resolution, often over kinetic time points. As a result they generate vast quantities of image files (up to the terabyte level), which require analysis using complex algorithms and expensive solutions for data storage and retrieval. Many are too slow to run large primary screens, and the data too rich to interpret over large compound sets, but HCA platforms are ideally suited for secondary screening or target validation. In contrast to imaging systems, laser-scanning technologies enable the rapid detection and quantification of multiparametric data from individual cells. One such example is the TTP LabTech ((a href=”http://www.ttplabtech.com”>www.ttplabtech.com) Acumen® eX3 microplate cytometer, which can monitor up to 12 fluorescent signals from objects seeded in plate densities up to 1,536 wells. The fast read times (down to 4 minutes per plate) enable the screening of up to 300,000 samples/day. In HTS mode, only information that is required is saved, reducing output files to levels that can be managed without data-storage servers. The whole-well scanning capability enables data to be collected from each cell within every well. Since cellular assays are intrinsically variable in their nature, this feature is ideal for use within a high-throughput environment to aid in the development of robust and reliable screening assays. The cell cycle represents one of the most fundamental and important processes in eukaryotic cells, culminating in cell growth and division. The process is strictly controlled by proteins in the cytoplasm. Defects in cell-cycle regulation are a characteristic feature of tumor cells and mutations in the genes involved in controlling the cell cycle are common in cancer. Monitoring dysfunctional cell-cycle regulation is thus of intense interest since it provides an opportunity to discover new targets for anticancer drugs and improved therapeutics. The measurement of DNA content as a cell-cycle marker was one of the first major applications of flow cytometry and is still one of the most common applications. For screening purposes, however, traditional flow cytometry has several shortcomings, most notably low throughput, the requirement for a large number of cells, the inability to analyze adherent cell lines in situ, and the absence of a total cell count. Standard methods measure changes in DNA content by staining the nuclei of fixed, or live cells, with a DNA intercalating fluorescent dye. This simple method is a common application for laser-scanning cytometers, giving an automated cell-cycle throughput of 100 samples in ten minutes. In situ reading preserves morphological changes that may have occurred during drug treatment, thus providing valuable secondary information, especially when analyzing highly differentiated cells. It also permits proliferation/cell stasis analysis or drug toxicity via a total well cell count. 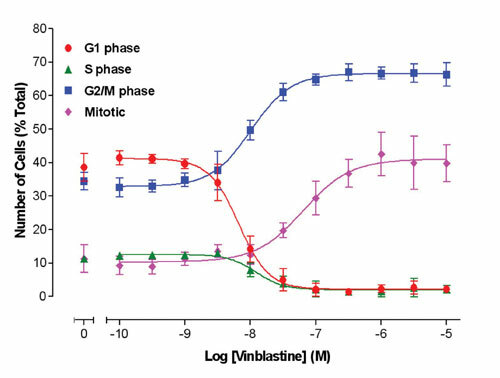 The utility of the Acumen eX3 for compound profiling has been demonstrated using standard agents such as vinblastine (Figure 1), which arrested CHO cells in the G2/M phase of the cell cycle and increased phosphorylated Histone H3. The use of cell colony formation assays for research and clinical applications to assess the functional integrity of cells after in vitro manipulations is extensive. Key areas include hematopoietic stem cell research, cell-transformation studies, and predicting the response of tumors to chemotherapeutic agents. Traditionally, enumeration of colonies has involved laborious and subjective counting by hand using a microscope. Using laser-scanning cytometry, with its high depth of field, a new approach to determine colony number through the application of a volume algorithm has been developed on the Acumen eX3. Such an approach permits the differentiation of cytostatic effects where the number of colonies and size remains constant and cytotoxic effects where the size and number may be reduced. The use of volume as an assay readout has been shown to be more representative of cell colony formation in vivo since it correlates well with the growth of higher-stage and higher-grade tumors, not supported by simply counting the number of colonies above a certain size (Figure 2). Laser-scanning microplate cytometry is a powerful technology for enabling cellular analysis similar to that of conventional flow cytometry or microscope-based imaging systems. With small data-output files, the use of whole-well scanning to generate reproducible and robust screening assays, plus speed advantages over traditional methods, this technology is entirely suited to a screening environment. When integrated with standard robotic screening systems, the system has a capacity to run approximately 300,000 samples/day, facilitating HTS of large chemical libraries against a variety of cell-based assays. Paul Wylie, Ph.D., is senior application scientist at TTP LabTech.